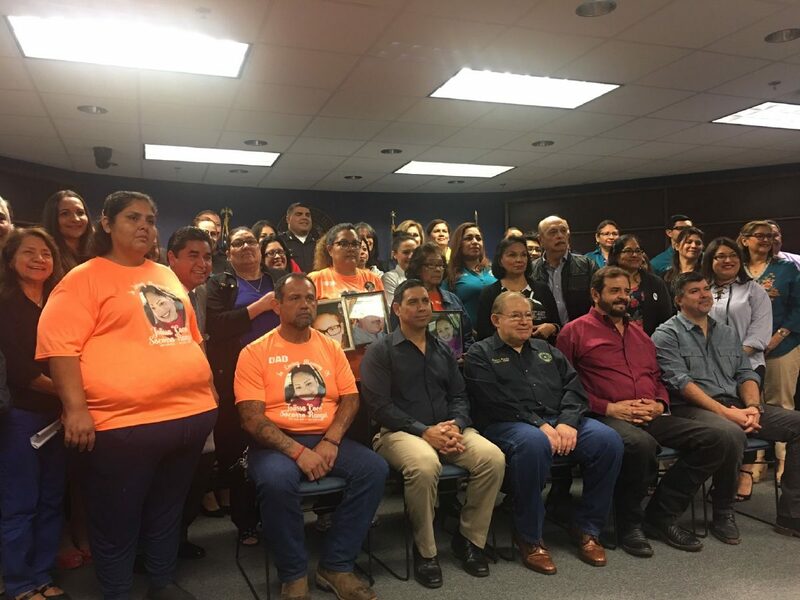 Hidalgo County Commissioners are seen seated from right, beside family members of violence, during Hidalgo County Commissioners Court on Tuesday, April 10, 2018. Finally. After years of studying ways to implement a standard step-and-grade pay system, Hidalgo County Commissioners on Tuesday unanimously approved a plan that should give pay parity to most county employees. Similar to a federal government pay grade scale, this Classification and Compensation Plan will put most Hidalgo County employees on the same pay grid based on their job and skills and will require them to meet certain merit standards, and be in the post for at least one year (sometimes two) before being considered for a step up pay raise. “This is something that is useful and fair to the county not just for now, but for a longtime to come,” Raul Silguero Jr., director of human resources, told commissioners. We agree. We commend Silguero for finally persevering on this process, which has taken over eight years to complete. And we urge him to do his utmost during an April 19 meeting with the Civil Service Commission to convince them of its necessity and viability for our county, so that it may be formally approved by the commission. If so, employees will begin to receive their new adjusted salaries on their April 30 check. Overall, adjusting 1,969 employees into 21 different grades of 11 steps will actually save the county $14,179 this fiscal year, Silguero said. Granted, that’s not a lot, considering the county budgeted $97.05 million for salaries this fiscal year, but Silguero said that through attrition, as employees leave and retire, and new ones are hired starting at mandated Step 1 grade, then much more savings should be seen. Of course, there is some flexibility built in to this new system. For instance, department heads will have the leeway to hire a new employee into a position and start that employee as high as Step 4 (not Step 1) if they have extensive education and bring desirable work skills to the post. That’s understandable, however we caution department heads to use this sparingly and resist from making this the everyday norm in hiring. Each pay step up amounts to an increase of 3.5 percent. That’s enough to entice workers to put forth their best efforts, and not too much to break our county’s budget. The lowest Grade 1 pay, for example begins at $25,056 for a clinic aid I position, and the highest pay is Step 11 of Grade 21 at $129,493, which are for the most senior, department directors. Exempt from this plan are 747 county law enforcement workers who have already been on a separate pay grid scale since 2015. Also exempt are 45 elected county officials, 63 part-time and temporary workers, and 310 other employees whose salaries are set by the county’s Board of Judges, and include court reporters, juvenile probation employees and county auditor staff. This has been a long time coming and we encourage the county judges and those in the District Attorney’s office, which have tended to balk at such a plan, to get on board and give it a chance. And recognize this is a way that Hidalgo County can save money in the long run — something we sorely need to do.